May Second Saturday features Lori hayes on a Walk and Talk on Weeds in Fairmount Park. A recent article in Horticulture Magazine highlights an app for weed identificationfrom the Extension at the University of Missouri. There is also a website version to download. Wouldn’t it be nice to know exactly what pesky weeds are growing within our gardens, lawns and/or fields and how we can get rid of them? Well, there is an app for that! This useful app, called ID Weeds—available for iPhones, iPads and also Android, was developed by James Meng, a programmer at the University of Missouri Extension. What does the app do? 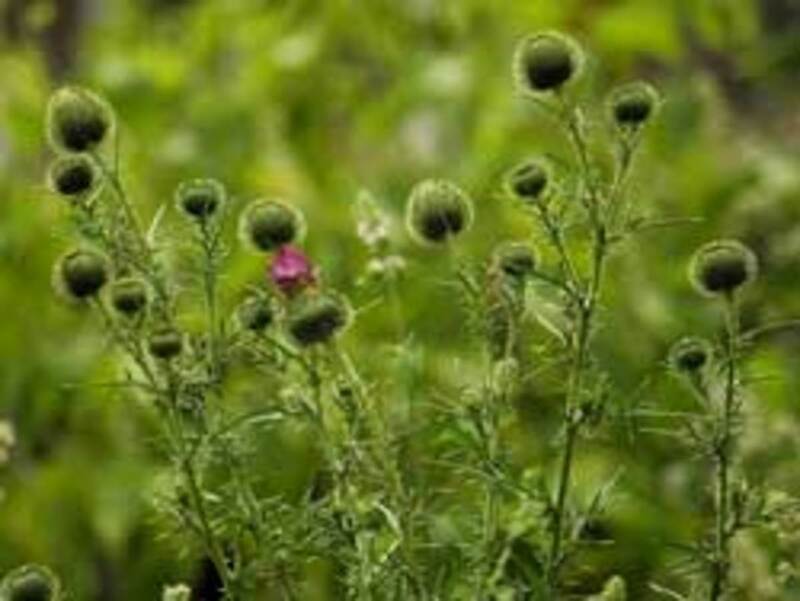 It helps users easily identify over 400 species of plants that can be classified as weeds., like Canada thistle (shown). How does the app work? There are an abundance of drop-down boxes with various weed characteristics that users can click on to figure out what type of weed they are dealing with. If the user doesn’t understand horticultural terms being used, they can click on “what’s this?” for illustrations. Once you have entered all the characteristics that apply to your unidentified, troublesome plant, you can press “Identify,” which will produce a list of weeds that match your selected descriptions. You can click on a weed from within the list for photographs and detailed descriptions to help you put a name to the irksome plant that has settled in your garden. In addition to drop-box characteristics to help identify the weeds, you can also simply search by common or scientific names of weeds that you know, for detailed information on them. With a little help from ID Weeds, you can control and eliminate the annoying weeds that seem to enjoy settling down in our lawns, gardens and pastures, reeking havoc among our beloved plants. To learn more about the app and how to download it, see the University of Missouri Extension website. There’s also a web version here.